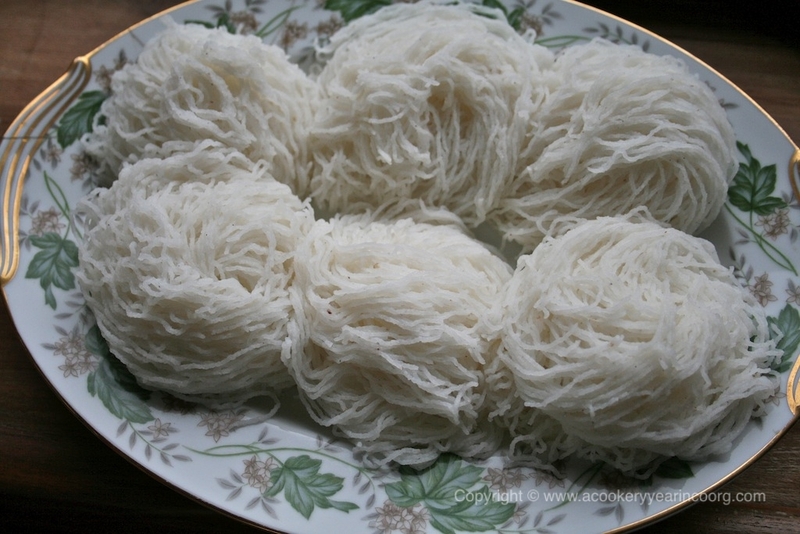 A nuuputtu wara or, if you have strong wrists, an idiappam or shavige press. Small plates or squares of banana leaf to collect the noodles as they are pressed. A spare pair of hands to help with the work. Bring the water to a boil in the pan and add the salt, cardamom and ghee. Add the soaked, drained thari and cook for 10 – 15 minutes on medium-high, stirring constantly once it begins to thicken. The mixture is ready when it forms a lump of dough that comes away cleanly from the sides and bottom of the pan. It will also be really difficult to stir at this point. Remove from the heat, cover with a clean tea cloth to keep the steam in and set aside for 10 minutes. While you’re waiting for the dough to cool, begin heating water in your steamer. Line the inside with cheesecloth or layers of muslin large enough to fold over and cover the contents. Have a bowl of warm water with a little ghee in it ready.When the dough is cool enough to handle, moisten your palms in the water, scoop small portions of dough out and press firmly into cylindrical forms, approximately four inches long and two inches wide. You can make these dumplings a little smaller or larger, depending on what size you plan to make your nuuputtus. They should however fit comfortably in the barrel of your press. Keep the bowl of water handy for the pressing process too. The water in the steamer should be boiling by now. Arrange the dumplings inside, fold the cloth over to cover completely. Put the lid on and steam for approximately 30 minutes on medium heat. If you’re using a bamboo steamer, increase the cooking time by 10 minutes and do not overcrowd the baskets. While the dough is steaming, prepare your press and a place to lay out the nuuputtus. Remove the steamer from the heat and open it to allow the steam out for a couple of minutes. You must work quickly, before the dough cools and hardens. Lightly moisten your fingers in the bowl of water, pick up a hot dumpling and begin the pressing out. Assuming you’re doing the turning, have your helper ready to receive the noodles on small individual plates. Move the plate in a slow spiral motion to allow the noodles to pile up in tidy, compact swirls. Transfer the puttus to a surface lined with a slightly dampened cloth (to prevent sticking and also drying out) and cover with a tea cloth until ready to serve.